I-CAR has for a while blessed the industry with a collection of guides to finding and launching OEM repair procedure websites. It’s since followed those up with a series of Repairability Technical Support articles teaching repairers how to find advanced driver assistance system information within those manuals. Late last month, it collected these posts into a handy portal/article, and insurers, estimators and repairers will want to bookmark the page to make sure they properly research the lifesaving technology. ADAS can include a multitude of items Insurance Institute for Highway Safety research has proven to reduce crashes, such as autobraking. Unfortunately, it’s often associated with car parts likely to be damaged in a wreck, not to mention basic tech like batteries, and both the collision itself and the repair process can compromise ADAS if you’re not careful. Adherence to OEM procedures for repair and calibration is critical. Finding these repair procedures means going beyond the the body repair chapter of the manual and researching sections collision repairers have traditionally associated with mechanics, something I-CAR alludes to in its ADAS coverage. In this vein, GM has warned shops that its free body repair manual PDFs are insufficient to fix today’s vehicles, and I-CAR points out how the same might apply for FCA. 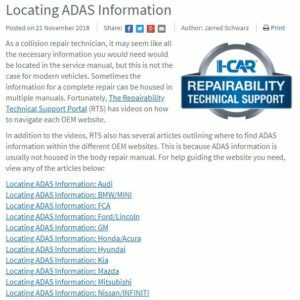 While you’re touring these new pages on behalf of ADAS, don’t forget to look for all other systems related to your repair plan. Seemingly basic operations or “mechanical” parts might also require research to do a correct collision repair; asTech’s Jake Rodenroth likes to observe: the repair procedures related to a routine battery disconnect might be more complex than you’d expect. 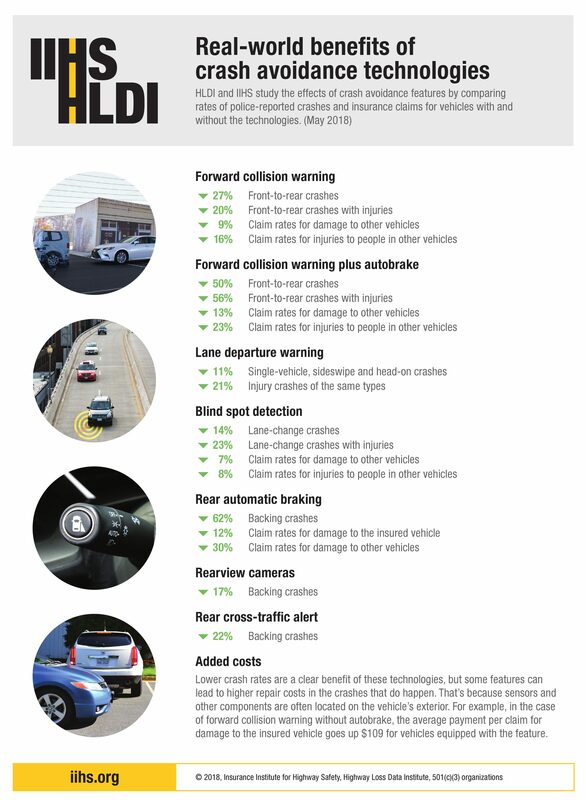 I-CAR provided another ADAS resource in 2016 when it launched the calibration matrix. The portal allows RTS users to look up all the options that might be found on particular vehicle, what the technology is called (OEMs are maddeningly inconsistent on terminology), and when calibration might be required. This is no substitute for obtaining the actual vehicle build data with an OEM VIN lookup or for researching and verifying calibration requirements in actual OEM repair procedures online. (I-CAR itself states on the portal that you have to use OEM information to calibrate a car.) But it’s still a valuable “cheat sheet” resource shops and insurers can use.